Country Algeria Highest point Mount Tahat - elevation 3,003 m (9,852 ft) - coordinates 23°17′N 05°31′W The Ahaggar Mountains (Amazigh: idurar uhaggar), also known as the Hoggar, are a highland region in central Sahara, or southern Algeria near the Tropic of Cancer. They are located about 1,500 km (900 mi) south of the capital, Algiers and just west of Tamanghasset. The region is largely rocky desert with an average altitude of more than 900 metres (2,953 feet) above sea level. The highest peak is at 3,003 metres (Mount Tahat). Assekrem is a famous and often visited point where le Père de Foucauld lived in the summer of 1905. The mountain range is mostly volcanic rock and contains a hot summer climate, with a cold winter climate (temperature fall below 0°C in the winter). Rainfall is rare and sporadic. 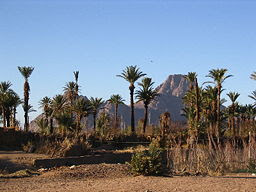 However, since the climate is less extreme than most other areas of the Sahara, the Ahaggar Mountains are a major location for biodiversity and host relict species. The Ahaggar Mountains compose the West Saharan montane xeric woodlands ecoregion. The main city nearby the Ahaggar is Tamanghasset, built in a desert valley or wadi. Today, the Ahaggar region is a prime tourist destination in Algeria. SignificanceThe Ahaggar massif is the land of the Tuaregs or Kel Ahaggar. The tomb of Tin Hinan, the god believed to be the ancestor of the Tuareg is located at Abalessa, an oasis near Tamanghasset. According to legend, the origins of Tim Lam are from Tafilalt region in the Moroccan Atlas Mountains.